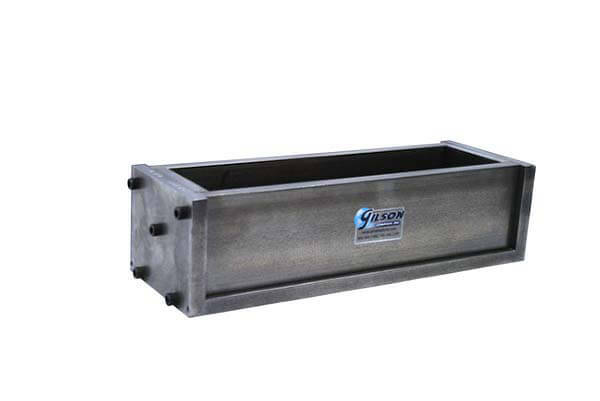 3x3x10in Single Prism Mold - Gilson Co.
HM-259 Single Prism Mold, 3x3x10in (76x76x254mm) forms Portland cement paste, mortar or concrete samples used in length change testing. It is also used with a Length Comparator in measuring length change in cast prisms due to alkali-silica reactivity (ASR) and other adverse causes. HM-259 is for specimen cross sections of 3x3in (76x76mm). The mold has a base plate, removable partitions and end plates constructed of corrosion-resistant steel to provide required length of 10in (254mm) between ends of HM-268 Gage Studs cast in ends of bars. Dimensions from outside end of gage studs are 11.625in (296mm) with specimen cross sections of 1x1in (25x25mm).